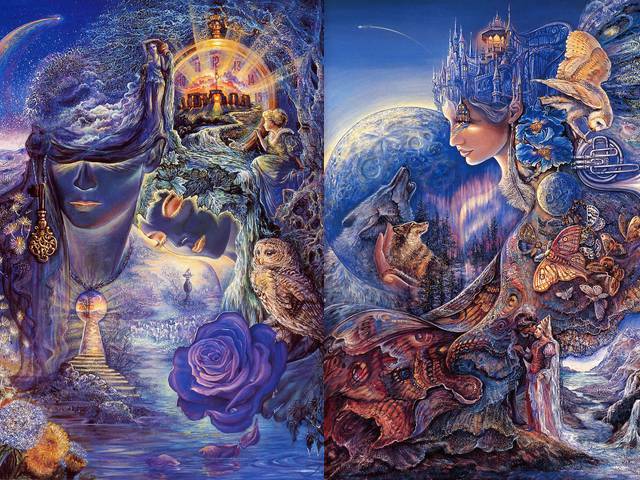 The fantasies in the paintings by the English artist Josephine Wall, give freedom and wings of our imagination. They are influenced and inspired by the illustrations of Arthur Rackham, the surrealism of Magritte and the romanticism of the pre-Raphaelites. 'The key to eternity' is a beautiful interpretation of the mystery of the time and all about the eternal circle of life, presented by the Lords of Time and the key to eternity, the ancient stone of eternal clock, a wise old owl and dandelions that spread the seeds of life. In 'Once in a Blue Moon' when a blue moon rises in the night sky, the enchantress welcomes her friend the wolf and the haunting melody, created by the howl of the wolf and the music of the owl, awakens the butterflies on the cloak for blessed flight.